This year, Dubai Drums full moon drumming event and the Eid al Adha holiday break are converging. What a lovely way to celebrate together the value of “unity” and “collaboration”and drum together as a tribe. 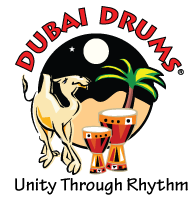 Come along next Friday and join in with Dubai’s community drumming crowd. Whether you are a complete beginner or an experienced percussionist, you can enjoy a night under the full moon with the wonderful energy of the desert, rhythmic sounds and great company. A super night out for the whole family, or anyone that wants to relax from the stresses of modern day living. Come and de-stress with them, its a lot of fun. Price includes drumming sessions, barbecue dinner, DJ, fire dancer, camel rides, sand boarding & shisha, along with the usual kids entertainment (balloon bender and face painter). Four wheel drive transportation is available from the desert edge to the Camp, so you can come with your saloon car if you don’t have a 4WD. 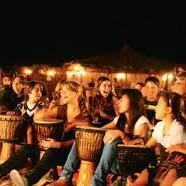 Tickets for Full Moon Desert Drumming cost 220AED for Adults, 100AED for Kids (6-13 years) and 5 years & under go for FREE. Along with full moon drumming merriment the price includes drum rental, a tasty barbeque dinner,.. The camp is fully licensed and although alcoholic beverages are not included they are reasonably priced which is a refreshing change. Arrival time is any time from 6:30pm ending around midnight, however families with little ones tend to leave after dinner. For more information or to book please email fullmoon@dubaidrums.com or call +971 56 744 2129.